Learning from the pros: Nursing student Nicole Rodriguez, center, is flanked by, at left, Lt. Cmdr. Philip Lafleur, a physician assistant, and Lt. Lonice Carter, a nurse, both with the U.S. Public Health Service Commissioned Corps Rapid Deployment Force 1. 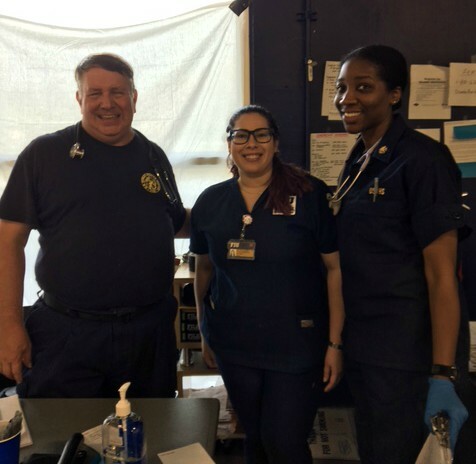 The USPHS ran a special needs shelter at MMC before and after hurricanes Irma and Maria. I am in my final semester of the accelerated BSN program track and had a volunteer opportunity to care for people in the special needs shelter on campus following Hurricane Irma. Those I helped were displaced from the Florida Keys and the U.S. Virgin Islands. My experience working with them was a humbling one. The evacuees have been living what seems like a nightmare. Many saw their homes destroyed and have nowhere to go back to. When I spoke with them, I could see their frustration and anguish. I couldn’t respond with “I know what you are going through” because, in reality, I don’t. I have not lived their experience and there is no conceivable way that I could fully understand. Working at the shelter taught me that there will be times when words provide very little comfort, and all you can do is be there for others. Aside from listening, I did my best to make their experience a little easier by spending time with them, getting them to play a game of dominoes and taking 20 minutes to hunt through provisions boxes in pursuit of an evacuee’s favorite flavor of juice. I was able to use the nursing skills I have acquired over the course of my program, taking patient vitals, such as blood pressure and pulse rates, checking blood glucose levels and feeding those too weak to help themselves. I even spent time talking with the youngest evacuee at the shelter, a boy of about nine or 10 from St. Thomas who had accompanied his elderly grandparents. He was excited to be starting school in Miami–a temporary measure so that he wouldn’t fall behind as his family waited to return home–and happy because someone had given him a brand-new book bag and Jordan sneakers. The smile on his face really touched me and gave me hope that the evacuees at the shelter will see better days. During times of tragedy and hardship, although difficult, I’d like to think compassion can see us through. I gained a lot by volunteering alongside the men and women of the U.S. Public Health Service, who ran the shelter. I’d like to thank them for allowing me to observe and learn from them. Nursing is not an easy job, and at times it can even be a thankless job. When you see the difference you can make in someone’s life, however, it makes everything—even my own throbbing feet at the end of the day—so worth it!